Officials in the ancient tourist attraction of Petra strengthen laws to stop any chance of selling land to any Jews – not just Israeli ones. Jordan is examining the tightening of laws that forbid Jews from buying land there, according to items in the Jordanian press monitored by the Elder of Ziyon blog. While the current Jordanian law already states that "it is impermissible for foreign persons or corporate entities that do not hold an Arab nationality to purchase, lease, or own directly or indirectly any immovable property in the kingdom," it appears Jordan is "still nervous that Jews might want to buy land in their country, especially in Petra which they are frightened will be taken over by Jews," writes the veteran blogger. He cites a report in the Watan News website that says local officials in Petra have been strengthening their laws against selling land specifically to Jews – "not just Israeli Jews but any Jews." The local legislation and fear of a Jewish land grab follow the legislation of national laws intended to loosen restrictions on foreign investment. "What can be said here is that the House of Representatives has a duty to answer these amendments and prevent the sale of land in Petra for non-Jordanians, because all the other guarantees of bans of sales to Israeli Jews are not convincing, and we know that there are Arab and international front-men who will come to buy the land, but no one knows who he really represents." 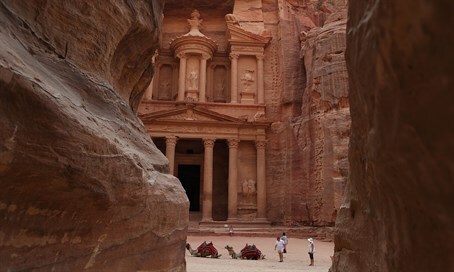 Petra, the Nabatean site often referred to in Israel as the Red Rock, has attracted Israelis at least since the 1950s, when Israel and Jordan were still at war. Adventurous youths were known to cross the border and make their way to Petra as a feat of bravado, and some were discovered and killed.